You know, today I've said this many times, we're living at the time of the greatest distraction, right? WMD - weapons of mass distractions - and they are literally just siphoning our life away, our life energy, and also just our time. And this is the most valuable asset we have. This is something you can literally not get back, alright? Our time is immensely valuable and it's getting consumed by all of these things that barely matter. Alright? So I think that our lives are really driven by our perspective, so I wanted to share this with you to help to kind of put this in perspective. You know, for the average US citizen, lives today on average about 78 years. Alright? The average person lives about 78 years. Now of course with our knowledge of health, and fitness, and nutrition, and stress management, all of the stuff that we talk about here, it's probably longer than that. Alright? A nice chunk longer, but for the sake of simplicity, the average person lives 78 years. And again, to put this in context, that's just 28,470 days. Alright? 28,470 days that the average person has. That's not a lot, you know? If you're looking at this by the day, how valuable is each of those 28,470 days? We probably don't want to miss one, alright? We want to try and get the most juice out of each and every day, each and every opportunity because we've got 28,470 days to make the most of this life. Again in parentheses, if you listen to The Model Health Show and apply this stuff, probably more. But you know, so many of us today are just wasting our time, we're wasting our lives because we have so much access to things that distract us, things that pull us off our game, and that take away our fulfillment. They give us instant entertainment, or something to do, again distraction, but not real joy and fulfillment. So I want to guide you to a life of more fulfillment. I want to guide you to a life of more health and sovereignty, and strength, and power, and willingness, and all of these powerful traits and character traits that lead to a well-rounded happy, healthy model life in every area. Now again, today more than ever, immense distraction, that's why I brought on probably the top person in the world right now in this topic to talk about this concept of deep work. Alright? Deep work. So this is creating the rules for focused success in a distracted world, alright? The rules for focused success in a distracted world. So whether you're in a situation where you're working for an organization, or you're an entrepreneur, or you're somebody who's just passionate about health and fitness, or learning about things- recipes for the family, and all these different things, we can get more done, we can absorb more, and be able to then share it, where we can engage in deep work. Alright? And so that's what today's episode is all about because not only do we generally devote less time to what really matters today, but when we do focus, we struggle. That's the problem. When we do try to focus, we struggle, and this has again never been seen before in human history because we have so much that's programming our minds to do this. We struggle to maintain focus. We struggle to find valuable meaning. We struggle to find depth, and today we're going to address that. Alright? A couple key insights, again from one of the top people in the world, if not the top person in the world in this subject matter. Before we do that, since we're talking about focus, I don't know if you've ever had Alpha Brain before, this is a nootropic that actually uses earth grown nutrients. Not only that, clinical trials done on it versus a placebo, and it is crazy to see the results. So two double blind clinical trials conducted by the Boston Center for Memory showed that with Alpha Brain, significant improvements in memory, and Alpha Brain wave patterns, so this is more focused brain wave frequencies, and just overall focus on particular tasks they were using in the study. Alright? So listen, this is clinically proven to work, give you that little extra edge. So check out Alpha Brain, this is from Onnit, this is their flagship product. I love Onnit so much, I love the team, I love what they stand for, I love how they do things. Again, nootropics are like hot right now, alright? Hot on the streets, but this is from earth grown nutrients. This is from real food sources, alright? This isn't some synthetic like taking a chance, rolling the dice here, trying to get a little bit smarter, alright? This is the real deal, so head over to www.Onnit.com/model. That's www.Onnit.com/model and you get 10% off everything. Alright? Their fitness equipment, Alpha Brain, Shroom Tech Sport. That's my pre-workout when I really need that extra edge, that's what I use. Alright? They've got the Hemp Force Protein. Head over there, check them out, www.Onnit.com/model for 10% off, and now the iTunes review of the week. ITunes Review: Another five-star review titled 'Great Podcast,' by DollsForever. 'I've always enjoyed listening and acting on the advice of Shawn and his guests, but I must say I totally agree with the things Chris Ducker presented in this episode. Money will come and go, but once you invest your time into something, it's gone forever. We spend most of our time and energy at work, but if the job we're doing is not our calling, it becomes routine and a grueling process. Money will buy a lot of things, but the most important things and the things that matter, it cannot. Shawn Stevenson: Wow, what perfect time for that particular review. I did not know that that was going to be the one shared today, and wow that makes me so happy. And like this today is just going to support that in a huge way. Like we're really diving in today on what it actually takes to create that sense of fulfillment, and to get more done, and to really make the most of our valuable time here. And with that said, let's get to our special guest and our topic of the day. Our guest today is Cal Newport, and he's Associate Professor of Computer Science at Georgetown University. In addition to studying the theoretical foundations of our digital age, Newport also writes about the impact of these technologies on the world of work. His most recent book, 'Deep Work' argues that focus is the new IQ in the modern workplace, and that the ability to concentrate without distraction is becoming increasingly valuable. He previously wrote 'So Good They Can't Ignore You,' a book which debunks the long-held belief that 'follow your passion' is good advice in three popular books of unconventional advice for students. 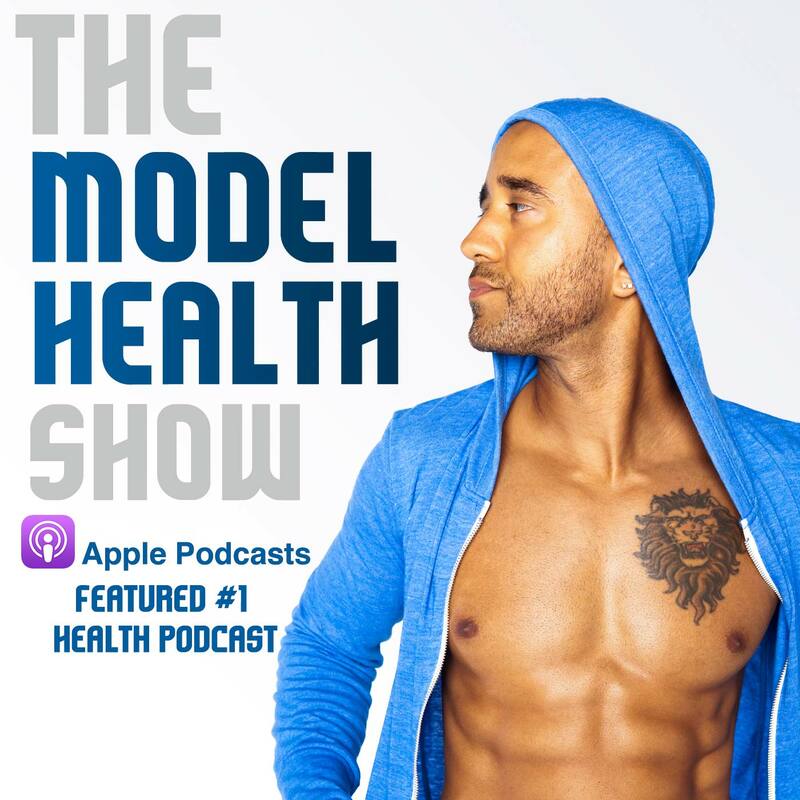 And I'd like to welcome to The Model Health Show, Mr. Cal Newport What's going on, Cal. Cal Newport: Hey Shawn, thanks for having me on your show. Shawn Stevenson: It's totally my pleasure. I just want to jump right in. I'm super curious what got you interested in this topic of deep work. I mean was like little Cal interested in deep work? Was little Cal interested in productivity? How did you become an expert in this? Cal Newport: It's a long road that led to this book. I mean that road probably starts when I'm a high school student during the first dot com boom, this was like the late 1990's. And I had a business, I had a dot com company, like a lot of teenagers did at that time. So here I was teenage Cal reading business books, and reading advice books, and reading Stephen Covey and time management books. And so I went off to college, and I said, "Okay I need to get the books on how I do this well. How do I master college? How to get the grades? How do I get a good ROI on the big student loans I'm taking out?" And no one was writing these books for college students. No one was writing serious business style books, "Hey here's what the best students do. Here's how to manage your time." So I went out and started self-experimenting and saying, "I'll crack this code." I took a whole semester and I ran experiment after experiment. "What if I take notes this way? What if I study this way? What if I change my studying habits this way, or do my calendar this way?" The result of that is that after that one semester of experimentation I got a 4.0 GPA in every semester between then and graduation. I was often doing this while studying less than the people around me, so that was a conversion moment for me, which was actually caring about these questions. How to do work well, how to organize your work well, giving that some time is going to have a huge payoff, and that stuck with me ever since. Shawn Stevenson: Wow, that's fascinating. I love that you have like tangible results, first of all, and then to replicate that. So moving into the college atmosphere, and especially with you working on getting tenure, and all those kinds of things, you mentioned kind of several times in the book in how you were able to accomplish so much in such a small amount of time by really engaging in this topic of deep work. So first of all, what is deep work? Let's define what that is for people, and then we'll just take it from there. Cal Newport: Right. Deep work is my term for the activity in which you are focused without distraction for a long period of time on a cognitively demanding task. Right? So it's got to have your full attention- and when I say no distraction, I mean not even a glance at a phone or a glance at an inbox. It has to be completely locked in attention on something that's cognitively challenging for you. That is deep work. Almost every other activity you do by definition will then say is shallow work. So you can really think about all of your professional activities as being one of these two things. It's either deep or it's shallow. Shawn Stevenson: So with that said, today we've got an immense amount of data, like we're swimming in it. Like there's massive content out there, and there are a massive amount of people who are doing work, who are in the workplace. Physical labor has taken a nosedive. There's a lot more knowledge workers today, and that atmosphere really kind of is a melting pot for distraction. And so I'm curious about how do we actually look at- first of all, let's kind of define the workplace today. What are most people engaged in? Because what we really want, and what you talk about in the book, is that there's a lack of truly great insights and ideas and content being created because we're so obsessed with all of the shallow work. And in the typical workplace we're dealing with a lot of meetings, and emails, and this kind of thing, and so we're just kind of tremendously distracted. So let's talk a little bit about the standard workplace, and then we'll go into what can we do to kind of take our time and energy back? Cal Newport: Yeah I think we have it completely wrong how we're approaching work in the knowledge workplace. I mean this is familiar to me. It's like when I arrived at college and said, "Wow these other students are terrible at studying, and if they were a little bit smarter about it, you could do much better." I see the same thing in the modern knowledge workplace; that we are working in ways that are actual terrible ideas if your goal is to take a bunch of human brains, connect them up in networks, and produce things that are valuable. So what we're doing now in the modern workplace is instead of the deep work, which is the best way to actually take your brain and produce valuable things with it, which is the primary goal of knowledge work. Instead of doing this, we fill the days with these sort of shallow activities, mainly communication. Talking about work, sending emails, responding to emails, the video game challenge of trying to stay on top of an inbox without the unread messages getting too large. Going from meeting to meeting, but none of this is directly related to using your cognitive resources to produce something valuable. And so what I think is going on is that knowledge work, especially in the age of digital networks, is just really, really new. I mean if you go back and look at how people used to run factories in the very early days of the Industrial Revolution, it didn't look like Henry Ford's efficient assembly line. We were running these things in incredibly inefficient ways because it was new, and it was complicated, and we stuck with things that were kind of convenient and easy. That's where I think we are in knowledge work right now. This idea that we should all just be hooked up to communication channels, maybe some Slack channels, or an email inbox where we have an email address associated with our name, and we should just be sending messages back and forth all day sort of working things out on the fly in an ad hoc manner, and jumping in and out of meetings. I mean all of this is just like the very early stage Industrial Revolution factories. There's new technologies, there are new pressures in the economy, and we haven't yet figured out what's the right way to work. Shawn Stevenson: Man, this is ringing true. And also this really brings up for me even how our education system is set up. It's still set up in very much the same way as the assembly line worker, you know? Getting people ready to work in a factory job, or on a farm or something, and we should be getting people prepared for working in this environment of knowledge workers. And of course schools are changing somewhat, but books like this, I think it's a real valuable tool for us to get our hands on. We don't have to wait around for the curriculum to change. And so I want to talk about a couple of the value points of deep work, and there's two in here that you talk about. The first has to do with learning, and I think this directly goes in with kids as well as us as people that are in the workforce and creating value. So let's talk a little bit about that; why deep work has this great value as far as learning is concerned. Cal Newport: Yeah this is one of the primary reasons why I think deep work should be a tier one skill for anyone in the knowledge economy, is because the better you are at concentrating intensely, the easier it is for you to learn complicated things fast. So if you're very comfortable with intense concentration, when it comes time to learn a new system, a new idea, new types of mathematics, or information system, or a new business strategy, whatever it is, the type of thing that changes incredibly rapidly right now in our current economy. If you're adept at deep work, no problem. Intense concentration equals very fast learning of complicated information. And of course the flipside is what we should be worried about. If you're completely uncomfortable with intense concentration, if you're of the unfortunate generation that has never known anything but life with ubiquitous access to the Internet on a phone in your pocket, and so your brain has never actually established any comfort with long unbroken concentration, it becomes incredibly difficult for you to pick up complicated things quickly. And this is a huge disadvantage in the knowledge economy. I mean, this is really going to put you behind and make it much harder for you to get ahead, for you to actually move ahead in your career. So the ability to learn quickly is one of the key superpowers that deep work provides you. Shawn Stevenson: Wow, man this is really troubling. I mean like when you said it, it kind of hit me. Like our kids are literally growing up with this technology and just instant access to distraction 24/7. Like my son who's in high school, I'm still just kind of fascinated that they can use their phones in class. Like I remember I was one of the first kids to have- this is really messed up, but I had a beeper, right? And my beeper got taken, you know? Just for having it at school, and now it's just like, "Oh yeah, you've got class time, you can jump around on-"
I'm like, 'Why is my son sending me memes at school?' You know? But it's just the nature of the situation. Cal Newport: It's a problem. I mean we're accommodating this, and I really don't think we should. We're so quick to adjust and say, "Well look, kids these days need to be on these phones, looking at this information, connecting with each other. That's just sort of what it means to live in a high tech world." But we forget that most of these tools, the tools that are capturing their attention, that are hurting their ability to concentrate, to function in our economy, these are products of the digital attention economy, right? I mean these are tools that are invented primarily just to extract time and attention from people that can be repackaged and sold to advertisers. It's taking the value that you could be producing as an individual by learning something new, or building something new, or connecting with your family, your friends, or being a part of your community. It's taking this value that you're capable of producing as a human being, and instead it's extracting it away and locking it up in the stock price of a small number of these large companies. It's basically allowing Mark Zuckerberg to have a massive house or three or four massive houses, instead of you being able to learn something hard so you can feed your family better. In other words, what I'm trying to argue is the thing that's- especially with young people that's capturing their time and attention is not some fundamental technology that's at the core of what it means to function in the modern age. It's basically just a tool for advertisement delivery. And so it's not just that we're giving up this tier one skill of deep work, but we're doing it so that a small number of advertising selling firms can do better. And I don't mean to go on a sort of conspiratorial rant here, but you have to understand, right now Facebook is valued by market cap $150 billion more than Exxon Mobile. They're finding it to be remarkably more lucrative to extract time and attention out of our heads than Exxon Mobile is finding it to extract oil out of the ground; oil that we actually need to fuel all of our cars and our machines. They're making more money, it's more valuable extracting time and attention out of our head. These are BMF companies. The attention economy has never had companies as large as companies like Facebook is right now. We've never had companies that were so large and so powerful built just on trying to distract us and just take our time and attention. And so 'Deep Work' in some sense is a rallying call to say, "I am more interested in using my capacity as a human being with a brain capable of doing magnificent things. I'm more interested in using this capacity towards learning hard things and producing things of value, for connecting with my family, for being a part of my community. I'm less interested in giving 340 minutes a week; the average amount of time the average American uses Facebook products to these large massive advertising conglomerates." Cal Newport: Focus is deeply human, focus is deeply productive. The ability to do this is something that we should be demanding to be in our life, something that we should be cherishing, and seeking. So I'm ranting, I'm a nerd, I'm a focus nerd. I'm a nerd about focusing, but as you can see it's something I get energized about because I think this is a huge issue on a lot of fronts in our current age. Shawn Stevenson: Wow. I'm just imagining Mark Zuckerberg trolling you like, "I'm a different kind of nerd." But the reality is, as like you said, when we're truly focused, when we truly give something our attention, that's where beauty really takes place, and that's where the great depth of our human potential can come out, you know? Just like all of this surface level stuff that we're engaged in, that we're doing, we're not really tapping into our potential. And this even goes to like you talked about learning, you know? 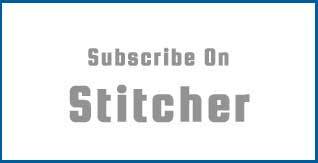 There's a lot of folks who listen to this show who are in the health and fitness field, or very passionate about it. This is how you actually can engage, and create more neuroconnections in your brain, and become very good at things, be it a physical skill, or some knowledge-based thing. There's a couple of ways that we learn. You know, one is through kind of rote memorization and continued exposure, and then another way is just really through something that's a really emotional- an emotional impact. That's why I do these shows, because I think it hits a real visceral spot for people, to get that emotional engagement. But you learn it better when you're able to truly deeply engage with the information. And so now let's talk a little bit about that, about kind of what's going on in our brain. So what is all of this distraction actually doing to our brain? I definitely want to talk about the concept of attention residue. Cal Newport: Yeah, well attention residue, I think it's something we should all be very worried about. I mean basically in the late 1990's, people were really into multi-tasking the old-fashioned way where they would actually have three windows open at the same time on their computer while they were talking on the phone. And people would say, "Hey I can do multiple things at once." Okay pretty quickly we figured out that doesn't work. I can't hear what's going on in the phone, or I'm missing what's going on on the computer, so people learned- I guess this would be somewhere in the early 2000's. "Okay, I'm not going to multi-task, I'm going to do one thing at a time." But what we started doing instead was almost single-tasking. So we just had one window on the computer, we're just doing one thing, except we do these 'just checks' every five or ten minutes. So I think I'm trying to write a chapter, but every five or ten minutes, maybe I have to do a 'just check' on my phone, and then a 'just check' of my Twitter feed, and a 'just check' of Google News to see what's going on. And what we've learned is that there's a phenomenon called 'attention residue' that's making those 'just checks' almost as damaging as pure multi-tasking. Because what happens is that the damage to your ability to concentrate, your damage of the ability to do high level cognitive work, it doesn't depend on how long you spend on a distraction. It's the context switch that kills you. So if I switch my attention over to an email inbox, see a couple emails that I can't answer now, I know I need to get back to them later, and then switch back to my main task. Even if I only glanced at that inbox for thirty seconds, that's going to leave what's called 'attention residue' in my mind, which can reduce my cognitive performance for ten, fifteen, twenty minutes going forward. The fact that I only looked at my inbox for thirty seconds doesn't matter. It's the fact that I switched my context to the inbox and brought it back; it leaves a residue. I mean this is easy to test in the lab, it's very replicatable. A quick switch of attention from your primary target, and then you come back to your primary target, performance plummets. So what's happening I think to most students and knowledge workers today, is that they're doing these 'just checks' enough that they are persistently in a state of attention residue. So essentially we are working today in a state of self-induced persistent reduced cognitive capacity. It's like a reversed neurotrophic. Like if I walked in and said, "Here's a drug that's going to make you like 20% dumber, it's just going to slow you down, and I want to make sure that you're taking this all day long," you would kick me right out of your office. Like are you kidding me? Get out of here. But if I do that same thing but I call it social media, or I call it Gmail, we don't realize it's having the same effect. So I think we're under-selling our potential in the economy right now because of the attention residue effect. We don't even realize it. Shawn Stevenson: This is blowing my mind right now because you just said reverse neutrophic, and that right there is a perfect selling point. It's just like why would we want to take something or do something that makes us less efficient? That makes us dumber? Like I think about the limitless pill, and then we've got like the Lloyd Christmas pill over here. So many of us are taking the Lloyd Christmas pill. And so you mentioned this attention residue, and I also have referred to it as a switching cost, right? There's a cost associated with you jumping back and forth, and I love how you said these 'just checks,' and really everybody listening, how often do you do that? You might be working on a particular task, something that you need to take care of, but you'll just check your phone real quick. You know, reach over. And what you're doing every single time is you're laying down more myelin to create this kind of neuroassociation to every time I'm trying to get focused, I distract myself every five to ten minutes. And your brain, it becomes incredibly hard to not do it, right? And we've talked about this several times on the show, Cal, of this whole idea, and really fascinating way that our brains become- like we're creating physical structure in our brain when we do this to ourselves. So it's just bananas, man. Cal Newport: Yeah, and it is permanent. That's the other scary thing about it. So attention residue is scary because it means you didn't even realize that you're reducing your performance. 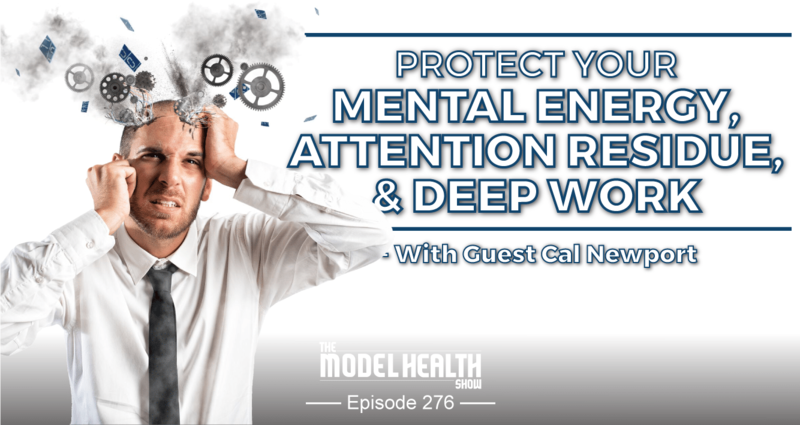 The hardwiring is the other scary part, that we have this increasing evidence that once your brain becomes used to getting these distractions all the time, it permanently reduces it. So then if you say, "Okay you know what? I'm going to go to a cave, somewhere where there's no Internet and no electricity, and I'm going to work really hard on this hard thing," you're going to fail if your brain has been hardwired to expect this. The late Cliff Nass at Stanford had this great research on it where essentially he could compare- he could put people who were sort of chronic distracted multi-taskers in a lab, and next to them he put people who really didn't do a lot of that in the lab, and they were both cut off from any source of distraction. They said, "Just work on these hard problems," and the chronic multi-taskers really had a hard time, even when their sources of distractions were removed from them because the brain had rewired. And you can get it back, and a lot of what I talk about in some of the chapters of my book is essentially what's the cognitive equivalence of sort of getting into shape physically. You can do it, it's a pain, but you have to think about it with that same sort of rigor. It's just like if I was going to go run a marathon, I'm going to expect that's going to take a lot of long mornings running around the track. It's the same thing if you've been a chronic distracted person, if you want to regain a deep work skill you can do it, but it's not something that you can change tomorrow with a few productivity hacks. It's actually going to take some pretty serious training. Shawn Stevenson: Yeah. Yeah, it's going to be uncomfortable. Well you know, I tell people there's this basic- especially when you take on a new habit, there's initially the first phase is like this new phase, you know? It's exciting, 'I'm going to get started, I'm going to do this new thing,' but then you hit the discomfort phase relatively soon where it's just like, 'I don't like this,' and your brain is even fighting you because it's so used to doing the same thing. And eventually if you can kind of push through that, and some tools to do that, just immersion, getting yourself in the right environment, the right kind of information, the right messages, creating some situations that eliminate some of these things like distractions or the negative foods or whatever, you eventually get to the state of comfort, right? But you still have to consciously think about it. It's like a conscious competence. You don't hear people say that very often, but when it happens, it happens, and that person knows what they need. So that's where eventually we can all get to. And I want to share this study in your book real quick. So this was a professor at the University of California Irvine observed knowledge workers in real offices and found that interruption, even if short, delays the total time required to complete a task by a significant amount. We're mistaking this busy work for actually being effective, right? Cal Newport: Yeah, we're mistaking that for being effective and I think we're building our work cultures right now primarily around convenience. Right? I mean it's really convenient for everyone involved if everyone can reach everyone else at any point. Because that means you don't have to do much pre-planning of your day, you don't need complicated systems that help decide like how does this type of work get done? You don't have to think ahead, you don't have to have pretty complex productivity type processes in place. If we can all just talk to everyone at any time, it makes your life easier in the moment as a worker. The point is though in a business, the goal is not to make life as easy as possible for the worker, it's actually to produce as much value as possible, and those things are usually directly at odds with each other. So that's what's so crazy I think right now about the way we run knowledge work workplaces. I mean imagine if I was running a factory, and I spent all this money on these robots for building the cars, but I kept stopping them and turning them off every twenty minutes because whatever, I needed to take a phone call, and they were loud, and it took awhile for them to come back online. We have to have that same type of thinking for the knowledge workplace. I get it that it's easy that everyone can email everyone at every point. And I get it that it's not obvious how you actually have to run an office if you can't do that. But it wasn't obvious to figure out the assembly line either, but you know what? Henry Ford produced 10X times more cars than all of his competitors once he figured it out. So I think we need more sort of Henry Ford type thinking when it comes to thinking about how do we actually approach work in the knowledge age. Shawn Stevenson: Wow, have we actually- everybody listening, have you actually thought about how 24/7 people have access to you, and you have access to everybody? It's kind of freaky. I was just listening to Chris Rock's new special, and he was talking about how when he was a kid, like his father left the house at 6:00 AM, and his mother didn't hear from him until 8:00 PM at night. And today it's just like constant- this constant connection. And I'm not saying that this is the reason that my relationship is really beautiful, but my wife- like we've already established that especially when I'm working, and especially engaged in deep work, my notifications are off, like she's just not going to be able to get in touch with me, and that's okay. Because a lot of times I'm actually just downstairs, you know? But the reality is like having that time away to actually focus on- and I feel so much better because I'm creating something that's truly valuable. I'm creating something great, and I feel fulfilled in my work, and so that carries over into our relationship, I feel. And so just be mindful of that. So what I'm encouraging everybody to do is just think about it. You've got notifications for everything on your phone. Instagram notifications, Facebook, text, email notifications. I'm just going to throw this out there, you're probably crazy right now, but that's okay, I still love you. We've got to back off. Like turn some of those notifications off and allow yourselves some mental space to actually get clear, and to actually do some deep work. Let's see, I want to talk to you about this concept in the book of the Principle of Least Resistance. Alright? Can you share what that is? Cal Newport: Yeah that's my idea that if you're in let's say a work environment, if you don't have metrics, hard data pushing back about what type of activities or behaviors produce more value than others, you can't just measure the number of cars that come off the assembly line per hour, people will default because of human nature to basically doing whatever is easiest in the moment. So this is sort of human nature is that if you can't push back and say, 'I know this is easier, but if you do it this hard way, we produce more cars, or we make this much more money,' we're going to default back to what's easiest in the moment. And my conjecture is, especially knowledge work, we don't have those clear metrics. We don't have a car coming out of the assembly line that we can measure how fast that's happening, so in the absence of those metrics, our behaviors have defaulted back to what's easiest in the moment. So the way that we work today with this sort of constant unstructured communication, this is just the Principle of Least Resistance in play. This is, 'Okay if my goal is to make sure that my life is as easy as possible in the moment, this is what you would do,' and so that's what a lot of our current work cultures are built around. Shawn Stevenson: Right, exactly. So true. So true, and how often do we do that to ourselves as well? Especially if we're not like- if we haven't created the habitual nature of like doing deep work, we'll just do the easy stuff. You'll just jump on, maybe do a couple emails, maybe do this little thing that is only getting a small percentage of the benefit versus the thing that- like the Brian Tracy 'Eat the Frog,' doing that big task that can move the greatest amount of leverage in your life. Let's talk about this neurological argument for depth that you cover in the book. You stated that our brains construct our world view based on what we pay attention to. I thought that was really fascinating, so can you talk a little bit more about that? Cal Newport: I was trying to understand this phenomenon that if you spend time with people who are serious deep workers, so they spend large amounts of their time concentrating intensely on a small number of very valuable things, they tend to be happier and more satisfied. And this was this interesting phenomenon that kept coming up again and again, in fact it wasn't even in the original proposal for my book. I added a chapter on this phenomenon because I kept running into it while researching the book. I kept running into this fact that why do these people seem so much more satisfied? And why is it that when you hear about them you feel this sense of, 'I wish that was me.' What is it that's so good about the deep lifestyle? Well this is one of the reasons, one of several reasons, why a deep life, a life focused on focusing tends to be more satisfying, is that our sense of the world - we have a lot of evidence - has a lot to do with what we pay attention to. If you're paying attention to a lot of stressful things, your understanding of the world is stressful. If you're paying attention to a lot of bad things you think, 'Well the world is bad.' It's the classic if you watch the local news, you're convinced that your city is rife with fires, car crashes, and crimes, because that's all you hear about on the local news. So deep workers avoid a lot of that stress, and bad news, and anxiety because instead of jumping around through tons of stimuli all day, they focus on one thing that's important, that's valuable, they do it well. And so their mind constructs an understanding of the world where there's valuable things in there, you're useful in the world, you're producing something valuable. So it's literally their brain sees the world differently than someone else who spends most of their time jumping around through different stimuli. And I would argue that the human brain is much more well-suited for that former approach to the world and is not very well-suited to what we do now, which is let's flood it with stimuli all day long. I mean that causes a lot of problems at all different ages, and so deep workers are happier people, and I think that's a big reason why. Shawn Stevenson: Let's talk a little bit more in depth about why it's not so easy- like somebody is hearing this and they're like, 'Well I want to really commit to having more time spent in deep work in my life. Let's talk about a little bit more in depth and why it's not easy to replace distraction with focus. Alright? Let's talk a little bit more about why that is. Cal Newport: Well you have to deal, first of all with both cultural and neurological obstacles. So that alone makes the transition to a life focused on depth much more difficult. So first you have all of these cultural pressures, that what's important is connection, what's important is speed, what's important is networks, being online, being connected, being visible, moving information around, being on networks, having other people see you, seeing other people, being a human network router moving messages back and forth, being a human news producer by following all these breaking news leads and knowing what's going on. There's a lot of pressures that say you have to do that. The fact that, for example, two billion people use Facebook, I think it's an absurd statistic. I mean it's an interesting service, I could see some people might like, but the idea that that's universal, that essentially everyone uses it, that essentially I'm like the only 35-year old who's never had a Facebook account in the country, like that's crazy. So you have all these cultural pressures that say, 'You've got to be living the busy lifestyle. You've got to be living the connected lifestyle.' That's actually getting a little bit better in recent years. I've noticed that because I'm out there a lot saying controversial things like don't be on social media or these types of things. I used to just only get yelled at, and now I have a lot more people who are actually yelling on my side. I can see that change. Okay so there's cultural pressures, but those we can get past. Then you have all the neurological obstacles to get around, which is if your brain has been wired to expect novel stimuli at the slightest hint of boredom, you have to do a pretty serious act of rewiring to just get it ready to do deep concentration, and I think the fitness metaphor is absolutely right when you want to think about trying to introduce deep work. You just have to think about deep work as like being able to run a triathlon, right? I mean it's something that you can do, but you have to expect it's going to take some hard training, right? It's going to take some training, you can't expect just to be able to do it tomorrow. It's going to be great when you can do it, you're going to be in great shape, you're going to feel great about it, it's going to be a huge positive thing in your life, but it's also going to take a lot of Sunday mornings in the local pool working your laps, right? So you've got to overcome the cultural pressures to say, 'No, no you've got to be connected. You have to be on social media. You have to be doing all these things.' You've got to get past that and you've got to get past the neurological obstacles, which is a brain that's not used to deep work, there's a lot of work to get it ready. Really fascinating thing, and so when we're thinking about the reason that we're doing the momentary checks, and just grabbing our phone just like out of the blue. Sometimes your phone will end up in your hand, and you don't even know why. Or you're like, 'I'll just check a post real quick,' and then you get sucked into what I lovingly call the Internet Black Hole, and it's like thirty minutes later. And why this is, is that this relates to a couple of key compounds in the brain. One is dopamine. Dopamine really is something that compels us to seek, alright? It really drives- and it's beautiful because this helps for humans to not just settle, and to continue to explore, and to try to reach our potential. Right? It drives us, but if we're just continuously seeking but never finding, we go insane. And so our brain has this really fascinating feedback loop that when you discover something, and you're seeking something you get it, you get a little hit from your opioid system. Alright? So it feels good to accomplish, right? It feels good to seek and find. The problem today is that the Internet is perfect for our hardwiring because every time you look for something, especially on social media, you find something. When you're scrolling, you look, find. Look, find. Look, find. And you're continuously getting this feedback loop from your dopamine system and your opioid system, and we're literally physiologically addicted, and I think we need to come to terms with that. It's like the first step is like, "My name is Shawn, and I'm addicted to Facebook." Like just having that real moment of clarity like this has a hold on me. And now we should have said in Cal's bio that he's not on Facebook, because that's probably like earth shattering for some people. But for me, I do use social media, but I have it in a different- I have a different perspective about it, and I have it in a different place. And it has not been easy, let me be clear about that, because it's like, 'I'll just check it real quick,' right? So creating these habits to just stay away from my phone at certain times of the day has been really helpful. So I wanted to share that with everybody. As a recap, we'll put that episode with Dr. Robert Lustig in the show notes for everybody. And what I want to talk about now is choosing a philosophy, right? You say it's important for us to choose a philosophy, and there are four different deep work philosophies that you administer in your book. Can we talk about what those are? Cal Newport: Right, because if you want deep work to be a regular part of your life, you have to recognize that it's very demanding, and therefore if you don't have some sort of clear and fixed philosophy about how you schedule deep work in your life, it's just not going to happen. I mean it's the exact same thing with fitness. It's hard to work out, and so if you don't have a really clear philosophy for, 'This is when I go to the gym or this is when I train,' you're probably not just going to do it naturally on a whim. So the same thing holds for deep work. So in the book I started listing different scheduling philosophies that I've seen people successfully deploy with deep work, and the idea was to show not that this was the exclusive list, but to show that there's many different options, and that you can tailor a scheduling philosophy to fit your particular personality and circumstances. So for example, one that I observed a lot of people use was called the bimodal philosophy, which is a philosophy where either I'm only doing deep work, and this is for an extended period of time like two days, three days, or I'm completely available and I'm connected, and you switch back and forth between these modes. You don't try to mix it together. So I profiled a professor for example who does this. When he's working on a paper, he'll drop off the radar for three days, can't reach him. Completely monastic, can't reach him. In between, his door is open. Students are coming in, everyone can reach him, so no one is that frustrated. It's not like he's gone for months at a time, but he disappears for a few days at a time so he can clear out all the attention residue. And everyone just learns, so they know, 'Okay we don't schedule things there. We make sure we get him to sign off on something the night before if we need something early.' It's a very easy heuristic for everyone to learn, and it frees up for them a consistent large block of deep work. So you adjust with the reality of your week. I call it journalistic because like journalists are pretty good at switching to writing mode when they have to because news breaks and they have deadlines, so it's much more of deep work for three hours, now I'm doing this, no deep work the next day, the next day is five hours in a row. So it's more of a sort of scattered shot, it's more of an advanced strategy. More importantly is the fact that there are different philosophies. So just because one doesn't work for you, don't have that bring you to a point where you say deep work in general doesn't work for me. You can adjust these scheduling philosophies to work with the reality of whatever it is you do. Shawn Stevenson: Yeah absolutely, and I want to share that the rhythmic version, that that's something that I employed. 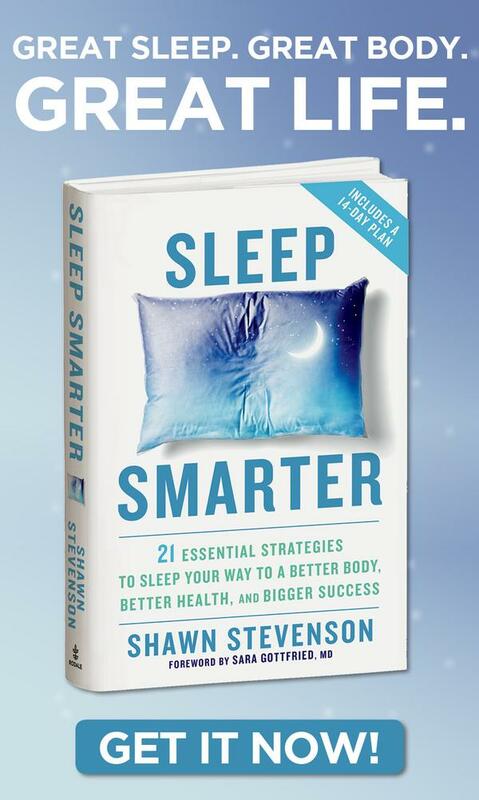 When I wrote the first version of my book 'Sleep Smarter,' and I was still working in the clinical practice, and so- but those mornings, we'll just say from 8:30 to 12:00, something like that every morning, like Monday through Friday, I'd be working on my book and then I'd see patients after that. Or you know, doing interviews on shows, or whatever the case might be. And so by me employing that strategy, this was something that enabled me to write my book very, very quickly. And you know, having a deadline looming. And so we don't have to stop everything we're doing to engage in deep work. We can build this into our life in a way that works for us, you know? You talked about some of these story people that would have like a couple of months away just pondering, and doing deep work, doing thought experiments, and then they come back to the world. But the reality is we all come back to the world, it's just how do you engage with it? How do you do that? And so this is something that worked for me personally, and I still do a version of that pretty much every day. I get that morning- especially to start my day, where I'm really engaging in those really important things and creating something valuable and special. So real quick guys, we're going to take a quick break because there are some other really important ideas that I want to cover, but this is important too. So we're going to take a quick break, so sit tight, we'll be right back. Alright we're back and we're talking with the author of the bestselling book 'Deep Work,' Cal Newport, and Cal, I would love to talk to you now about what are some tips for us to kind of help to create the conditions? So we talked about the conditions for problems and distractions. What are some things we can do to create the conditions for us to easily, if possible, fall into deep work? Cal Newport: Right so the scheduling philosophy is step one. Step two, people who are adept deep workers tend to have rituals that surround their deep work sessions. I mean as far as I can tell from a sort of psychological and neurological perspective, what's going on here is if you have some sort of set ritual you do, it helps your brain shift into the deep work mindset without you having to expend a lot of mental energy or willpower to try to wrench your attention away from something else. So Charles Darwin, for example, it's sort of a favorite example of mine. When he was working on the 'Origin of Species' on his estate in Kent, England, he had built a path called the Sand Walk because it was paved with sand, that went past the most scenic parts of the grounds that he owned. By lap one, the concerns of the day would start to wear away. By lap two, he could start booting up in his brain, 'Okay what are the actual issues I need to think about today?' Maybe by lap three he's starting to actually make some progress, and then he could go from those laps into his study and be prepared to do some real deep work. And that was much more effective than if he just said at some point, 'Okay deep work time,' and just swiveled his chair towards the desk and tried to work. Modern deep workers do the same thing. Sometimes it's location, a certain location they go to just for deep work. Sometimes like Darwin, it's a particular movement pattern. You walk a particular path, you do certain blocks around your neighborhood or on your corporate campus. For other people it's taking the space in which you normally work and transforming it. So if you have an office, for example, it might be clearing everything off your desk, dimming the lights so you just have the bright desk lamp on your lamp itself, shutting the door, maybe putting a Do Not Disturb sign on it. That transformation itself can be ritualistic and help your brain understand. The other part of these rituals that I see often with successful deep workers is they have very clear rules for how the deep work session unfolds. So they don't have to think about it, they don't have to have these battles with themselves during it. Often it's very simple things like no Internet, no phone, maybe the phone gets turned off. Shawn Stevenson: You just said something important. Let's talk about our mental energy and how that it's not something that's infinite, alright? So let's talk a little bit about that. That we've got a certain amount for us to use. Cal Newport: Yeah, well mental energy is incredibly important because feats of cognition use an incredible amount of energy. And we underestimate how much actual metabolic energy is required to do intense thinking. We could think about it relevant or relative to other types of physical acts that are actually very demanding. It uses a lot of energy to do a lot of cognition, which means a couple things. I mean one, you don't want to waste energy, like we were just saying. You don't want to waste energy trying to convince yourself to do deep work because that's energy you can't devote to it. But our brain is not wired through evolution to recognize the long-term value of doing deep work. Right? So the deeper parts of our brain, the planning parts of our brain maybe sees an upcoming deep work session as something like, 'Ugh, why are we going to waste all this energy?' You're going to experience that as a feeling of procrastination, or lack of motivation. And so recognizing that is why it requires a lot of ritualistic support and scheduling to actually convince yourself to get started with it. And the third implication of this is that other types of shallow activities are not neutral. They use energy. Especially the social energy that's involved in having to track lots of back and forth social interactions with people you know, that's incredibly draining. Tribal energy- like we're tribal people, so if you're engaged in looking at lots of political or cultural news where you're sort of on one tribe, and someone else on another tribe, our brain is really attuned to that and it's going to burn a lot of energy. Think about the emotions you feel every time you check the news these days. That's burning fuel that could be going towards producing new things of value. And so that's the third implication, is that it's not harmless to spend the time surrounding your deep work doing lots of these other sort of shallow or unnecessary busy things. All of that is emptying out the gas tank of the fuel you need to actually produce new things that are valuable using your brain. Shawn Stevenson: Oh, everybody you've got to be more judicious in how you use your mental energy. Again, this is a finite resource each day, and that's okay, you know? And I don't know if anybody's ever experienced this, but after kind of an arduous day of work and thinking, you just don't want to even make a decision. You know? Just like your spouse might be asking, "So what do you want for dinner?" "I don't care. I really don't care." But if you were to ask that earlier in the day, it's just like, "I definitely want to have stroganoff," or whatever. I don't know why I said stroganoff. It's so random. I'd get up, I'd have my morning water, my inner bath, and then I'd do some meditation, I'd do a little bit of exercise, I'd get my kids out the door, alright? So I supported in that, and getting them all ready to go, make sure they're fed, and then I'd make my kind of superhero coffee I make. Head down to my office, make sure everything is cleared off my desk, I don't want anything there, and I have my water bottle sitting right next to me, and my superhero coffee, and that's when I'd start. You know it was this routine and I just- I craved it. Like I craved getting started, I craved getting to that spot. And that's something that we all can kind of aspire towards. So one other thing I want to talk about- well maybe two, but I want to talk to you about why you advise people to embrace boredom. It's like I've never heard such things before. Why do you say that? Cal Newport: Well the simple reason is if every time you feel bored you dispel it by giving yourself some novel stimuli from your phone or computer screen, if every time you're bored you do that, your brain starts to develop Pavlovian connection. Boredom means stimuli. Boredom means stimuli. If you have that Pavlovian connection built up, when it comes time to do serious cognitive work, to do real deep work, that type of work is by definition boring because there's not a novel stimuli because you're focused on one thing. If your brain has been taught, 'I always get stimuli when I'm bored,' it's not going to tolerate deep work when the time comes. And so what I advise people is not that you have to spend your entire life bored, or there's something good intrinsically in being bored. What I say is that you have to have regular practice with being bored and just being okay being bored. If you do that a few times each day, what you're doing is you're breaking your brain's understanding that boredom always means stimuli. So that's why I advise people, "You don't have to be bored all the time, but you'd better be bored a little bit every day, or your brain is not going to be able to do deep work." And so I say, "Go do some errands without your phone. You know? Do some stuff- stand in line at the bank and be in line at the bank. Stand in line at the supermarket and just be in line and be a little bit bored." It's not going to kill you, but what you're getting is this bigger advantage of teaching your brain sometimes we get stimuli and sometimes we don't, and it keeps it comfortable with both, and you have to have comfort with both if you're going to succeed with deep work. Shawn Stevenson: Perfect, perfect. So yet another- this is like a tangible thing for us to do and to consider. You know, say you're having dinner with your significant other and they go to the bathroom, tendency is to grab the phone and start browsing around. Just sit, you know? Just sit. And this doesn't mean you have to actually sit and do nothing. You could people watch, you could think about the meal, you can think about an idea that you've been pondering, whatever the case might be. But actually use your mental muscles instead of just constantly jumping to distraction. And again, this is- awareness trumps everything, so just starting to think about the awareness of these things I think is going to help us all a lot. So wow, this has been fantastic, and I've got so many nuggets of wisdom myself personally. I absolutely love your book, and I encourage people to pick it up because I think it's a vital resource moving forward in our world today. And if you could, I would love if you would share what is the model that you're setting with the way that you live your life personally for other people? What is the example that you're setting for others in how you live your life? Cal Newport: The way I like to think about it, is what I'm trying to do in my life is a focus on a small number of things very intensely. So in my case it's writing, and it's the computer science research I do. I focus on a small couple of things very intensely to the exclusion of lots of other things. Lots of other things that have little nuggets of value, things that because I don't do can cause inconveniences, can sometimes upset people, can mean that I miss out on certain things. I mean I'm ignoring a lot of things so I can focus intensely on a small number of things, and it has been a very successful formula. It's been a very successful formula. By focusing on a small number of things I do best, and trying to do them as well as possible, I find my life is more meaningful, my life is more satisfying, I think I've been more impactful, I think I now have more autonomy over what I do and when I do it because the value is value in the market. The market doesn't value busyness, it values what you do best, and so that's what I'm trying to model. I know a lot of these things that drive our busyness have some value, have some attraction, and I know that if you step away from some of these things you will lose some value and you'll lose some attractive things, but it's okay. Net-net you are going to end up better off more fulfilled as a human, more happy, more satisfied, more successful if you focus deeply on the things that really matter in your life and are just comfortable missing out on the other noise that surrounds it. That is the formula for thriving. It's worked for me and I want other people as much as possible to at least consider following my lead on that. Shawn Stevenson: Perfect. Cal Newport, can you let everybody know where they can find your book and where they can connect with more of your information online? Cal Newport: Well I have a website, www.CalNewport.com. You can find out about my books, also I've been blogging on there for over a decade. I'm a big bloghead. So if you want to dive in and engage with some of these ideas and see what I'm about, you've got a decade's worth of archive there that you can have some fun with. Shawn Stevenson: Listen, I'm just like- I'm blown away at your strength because I know how seductive this stuff can be with social media, with all the different changes, just because everybody's on it. And for you to just kind of take this stand, and to get out, and to talk about this stuff I think it's pretty courageous. Even though it sounds crazy, just for you, it's just how you live your life. But I just really admire that about you because it's something that's pretty rare today, but also it's bringing a tremendous amount of value. Like you're pumping out work like nobody's business. Like high quality valuable work, and people can get the vibe just by talking with you that you're somebody- like you know who you are, and you're confident in that, and you've got your life, you know? Your family, and you've got your work, and you just seem like you've really found a secret that all of us can kind of tap into, and you're out sharing it. So I just want to say thank you. Cal Newport: Well yeah, I appreciate that. I've got to say though, the advantage of publicly speaking about not using social media is because I'm not on social media, I don't see all the mean things people say about it in return. So that helps. It's my secret weapon. Shawn Stevenson: Mark Zuckerberg is trolling you, but you'll never know. Love it. Cal Newport: But I'll never know, yeah. Shawn Stevenson: Awesome. Everybody, that's Cal Newport. Thank you so much for tuning into the show today, I hope you got a lot of value out of this. Man, there are so many facets to consider here, and I know this might even sound like some Indiana Jones, like out there adventure, like not being on social media. I'm not advocating that, Cal definitely is, I'm advocating you to be aware. I'm advocating you to put this in its proper place. A lot of people today are doing like technology detoxes, or social media detoxes, and everybody just kind of continuously comes back like, "You know what? That was amazing. It was one of the best things in my life." Why don't we do that more frequently? You know, why don't we put these things in the proper place and really engage with deep meaningful relationships, deep meaningful work, and not allow these things to control us? Because in many ways they do, and this is our opportunity, like if we want to create a great life, great health, great career, great relationships, we have to understand that we don't have a lot of time to mess around. And I love this quote from Seneca, and I want to share this with you guys today. He said, "So it is, we are not given a short life, but we make it short. And we are not ill-equipped, but wasteful of it. Life is long if we know how to use it." He said this a long time ago, and today it's not- at any point in human history is this more true, so kind of abide by those words. Listen to Seneca, he's kind of a smart guy. And also just a quick powerpoint here, this is one simple strategy that I would like you to try out, experiment, employ, is to not use your phone first thing in the morning. Alright? This is your opportunity to start your day to accomplish your goals, to get stuff done, do your self-care. If you go right to your phone, guess what? Check your messages, check your email, your putting other people's priorities in front of yours, right? And even if you don't address them, you know, actually go and reply, it still starts to take up mental space and that willpower that he talked about. Alright? So be mindful of that. Just give yourself thirty minutes before you go to your phone. A lot of people are like, "Well my phone is my alarm clock." Get an alarm clock, alright? It doesn't have to be your Swiss Army knife, okay? I promise there's actually alarm clocks still out there. And also, avoid answering emails first thing, and also right at night, you know? If you plan on getting in bed, "Let me check my email real quick," terrible idea, alright? I'm not saying don't do those things, but just those key times when you're really revolving around getting great sleep and having a productive day, be mindful of that. 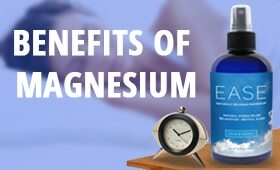 Last thing, I advise you overall to give yourself a short screen curfew at night period, and this is for helping your body to create more melatonin, because we know Harvard researchers have proven that the spectrum of light coming from your device, blue light spectrum specifically, suppresses melatonin and increases cortisol. For every hour that you're on your device, it'll suppress melatonin for thirty minutes, alright? And it just builds up from there. So be mindful of that, and also just the busyness of the mind can help to calm things down, ease into a great night of sleep, because a really great day starts the day before. Alright? So I appreciate you guys immensely. If you've enjoyed this episode, make sure to share it out with the people that you care about on social media, so they get something of value, and hopefully they get off of it and then they go do something special and create some work. And that's what I want you to do as well.